Each of the individual offices are being sub-leased to like-minded entrepreneurial types in the digital space. Currently the inhabitants of this microcosm of the digital marketing ecosystem include Camille Fetter of Talent Foot (digital marketing recruiting), Mark Ailsworth of Elevation+ (digital marketing sales), and Adam Carpenter of Vevo (online video platform). 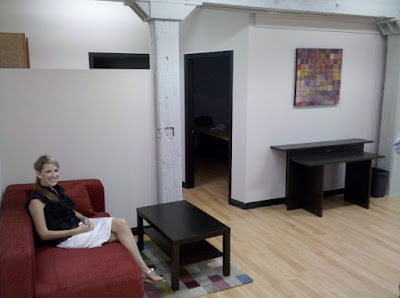 We still have 2 open offices and 4 open desks so, if you like what you see and want to join the party, by all means, get Connectual! 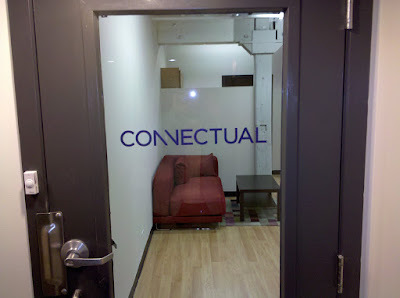 From the front of the building, you'd never know this place was a hotbed of digital marketing activity. We have an open door policy... except when it's closed. Camille leads up the welcoming committee. Aaron counts up the number of offices currently occupied. Plenty of "cizzle" in the corner office. All work and no play makes Mark a dull boy. When it comes to conducting business, Mark walks softly and carries a big stick! Conference Room A remains unused as of yet. Conference Room B sports that fine artwork of Caitlin Ailsworth. Kitchenette and bathroom, aka Break Room. No Blackberries allowed! Open office #1. Can you picture yourself here? Open office #2. Won't you be my neighbor? The hallway chatter is the best part about the place. And it's a long hallway! Can you tell who picked out the red accents for the office?